The hotel has 224 elegant guest rooms of various types, high speed wireless Internet connection, convenient transportation, and gym facilities. It is your ideal choice for business trips and family leisure travels. Address: 398 Kong Gang Yi Road. Only 5 minutes' walk from hotel to Shanghai Hongqiao International Airport, Terminal 1. From hotel to National Exhibition&Convention Centre: only 13 minutes by metro and 8km drive. For lunch and dinner we prepare set menus for different customers. Chinese and Western guests do have several options to facilitate themselves and do not need to wait a long time, especially business guests of the surrounding area who come dine over. The Restaurant Bar will always offer guests coffee and tea until 10PM, in addition to some imported French red and white wines and classic cocktails. Guests can sit at the lobby bar to enjoy their relaxing time. Hi , We ( our company group 6 person ) stayed here from 14 - 19 Apr , we thought the hotel supposed to have Star services but it turns not. Firstly , the daily breakfast is not good quality, and we don’t have many options to choose . The food generally are too salty and oily which doesn’t make sense for Healthy morning. Secondly , the restaurant manager she ( sorry that we forgot her name ) is kinda of rude. We greet her once in the morning , she didn’t respond back anything . On 18th April afternoon , when we finished our business meeting outside back to the hotel , we gathered in the reception and would like to have one short briefing in the lobby restaurant. She approached us and said we are not allowed to sit here unless paid in the restaurant. She wanted us to sit outside in the lobby . This really shocked All of us since we firstly are in house guests , secondly there aren’t any available space/seat for 6 of us to sit outside ( there is one sofa in the lobby but 2 persons are already sat down ) . Other then that , the reception and front desk staff are friendly and helpful. Hope the F&B Department can improve its product and services. Fantastic. Great service; very nice room, very clean and quiet. Perfect location. Wonderful. I cannot understand why this hotel gets low reviews. IT IS AN AIRPORT HOTEL WHICH IS PRETTY CHEAP AND FIVE MINUTES WALK FROM T1. There are no restaurants nearby; but that it BECAUSE IT IS AT THE AIRPORT. Crazy. Nice comfortable rooms. Quiet. Good service at the front desk and good English spoken. If you have an early flight from T1 this is perfect. If you don't, then there's really no point in staying here. But that is its raison d'etre. The hotel was good with good location for transit passengers. But the bathroom was smell like public toilet and the towels were also gave a bad smell. It look like they folded already used towel again. I came to front desk. The girl asked for the room rent. I gave her 100 RMB more by mistakenly. She counted 2 times and did not shows that she get excess amount. When I told her that I gave you cash more than room price. Then she recognized and get back 100 RMB. The hotel staff should be honest enough to refund money to the client if some one make a mistake in counting. Clean & tidy. Just a bit noisy while people talking loadly in the corridor. The shower tube was broken. I arrive around 10pm, no room service available. The breakfast is good with reasonable choice, taste good. Nice to hv shuttle service to high speed train but not frequent enough, cannot take it. A bit long to wait taxi to come. The booking was cancelled automatically, should hv warning n credit card guarantee option. the bed was comfortable but seems air conditioner was not working properly. Overall it was a very smooth and efficient experience. Only small criticism would be a lack of take away option in the lobby restaurant. Would be nice to have the option of having a coffee in my room. I always stay at your hotel due to the best access and reasonable price for 25 ㎡. The restaurant serves selectable foods for breakfast. The room curtain can keep a darkness when sleeping in the night. Easy to catch taxi too. Unfoutunately, there are no shopping area near the hotel except two restaurants and one convenience store. That case, you can visit terminal 1 . Good experience overall. Wifi is slow. Breakfast is OK, could have some more western options, not only asian. Hotel personel is very nice. room and room condition was ok. but there was no extra option then Noodle to eat on late night time. Walk in rate much more cheaper than I booked advanced through expedia 2 months ahead. Will not recommend your hotel to others. I stayed at this hotel during a trade fair, when close proximity to the exhibition center was the main selection criterion. Unfortunately, this is not a real Mercure but a franchise managed by some local company.Usually I don't mention the decoration but my room was extremely dull and depressing. Beds were generally OK, so was the bathroom. The room was not clean, and expensive wood furniture was worn out a lot. The good point was that the bottled water and coffee/tea bags were supplied daily, which is important as the weather is hot even in September.The breakfast was expensive but neither varied nor tasty; it was a challenge to find some fresh vegetables or bakery, or something familiar to the European person.The metro station is a few minutes away from the hotel, but a ride to the center may take 40 minutes or more. Surroundings are not interesting (some airport facilities mostly), but you may walk a kilometer or two and dive into authentic Chinese life :)Generally, I would consider another hotel around, as this one is 2* at most. I was confirmed breakfasts included but the booking system did not show the inclusion. The clerk needed to reaffirm with her senior before inputting the breakfasts into my room during the entire stay. As a gold card member, the clerk upgraded me to a high level of room only after she checked into a very small room and after my complaint. In addition, she did not offer me my welcome drink vouchers, to which I was also entitled as a Gold A-Plus member. Finally I was supposed to check out on 20 December but this message showed that my check out date was 2 days earlier. I believe the hotel may need an overhaul in its reservation system. In spite of the above, the hotel located near the Hongqiao Airport T1 and just opposite to the MTR Station of Line 10, which made it conveniently travel to town center or other Hongqiao Airport Terminal and Railway Station. Rooms were clean and quiet in spite of the hotel just opposite to the runway. Reasonable price, close to airport & train station, and clean. I will check in next time I visit Hongqiao area. 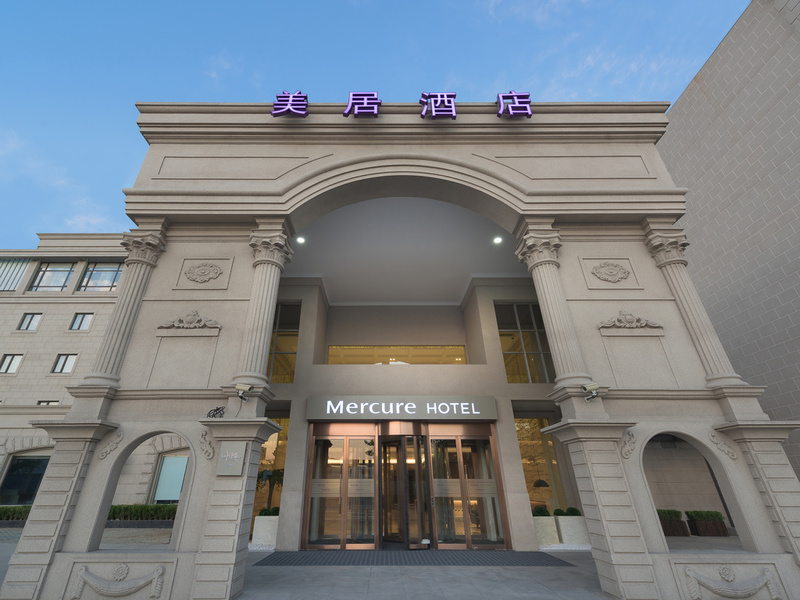 We have stayed 2 nights at Mercure Hongqiao Airport. The English speaking receiptionist is very detail minded and friendly. She allowed us leaving our lugguages at the luggage room for 10 days, as we book the 3rd and 4th night at the same hotel after 10 days tour in Yunnan. The location is superb, 1 mins walk to Metro Line 10. Highly Recommended! The first time in my life . Staying in mercure hotel with no fridge in the room. Very convenient for access to train station for near city and airport. Clean and not small room, smart reception. Even limited choise for dinner, local store there. Will stay again when just stop by Shanghai. The position is quite convenient which is just closed to the subway station.